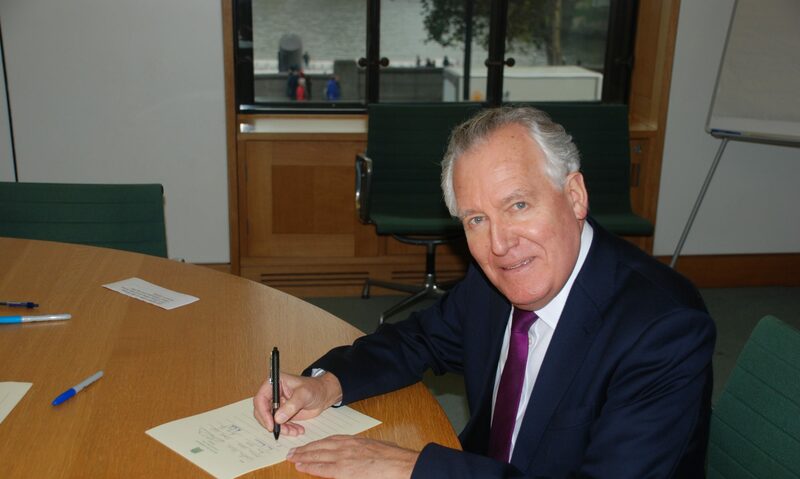 Getting out on the doorsteps and meeting voters face to face is more important than ever in this election, according to former Welsh Secretary Peter Hain. The ex-Neath MP is convinced that in this tightly-fought election personal contact is much more effective than cold-calling or social media campaigning. This is the first general election since 1983 that the former anti-apartheid activist has not been a candidate. Mr Hain has been knocking on doors in Carmarthen West and South Pembrokeshire in an effort to turn the seat from blue to red and send Delyth Evans to the green benches of the Commons. Underscoring the importance of meeting voters in person, he said: “I think that this election is more about doorstep work and personal contact than any in my experience. I’ve always believed direct voter contact is much more important than telephone canvassing or digital communication. Mr Hain tried to defeat Conservative David Mellor in Putney in the 1983 and 1987 elections but won Neath in a 1991 by-election. He dismisses comparisons with 1992, when Labour and the Conservatives were deadlocked in the polls until John Major got on his soapbox and secured a majority. Mr Hain grew “really worried” on polling day that year when he heard turnout in Sussex was “unusually high”. But he said: “[This] is completely different. This is multi-party politics. His “gut feeling” is that Labour will emerge as the largest party and he doubts whether his party will experience the meltdown in Scotland that has been forecast at the hands of the SNP. However, he said: “The irony is the more people vote SNP the more likely David Cameron will lead the largest party. That’s simply the reality. Describing the type of leadership he hopes Mr Miliband will provide, he said: “I think he will be a very strong prime minister and I think he will show real guts and vision. In the meantime, he is coaching a new generation of canvassers on the basics of doorstep campaigning. In particular, he drills them on the importance of pushing leaflets all the way through letter-boxes. A further word of advice is to stand well back from the door and give voters plenty of personal space. Ed Miliband’s Labour government will take office in the toughest of circumstances: our public services on the rack because of cuts, a weak economy with hesitant growth based upon personal debt, housing assets and consumer spending, and with a record trade deficit. Despite the constant Tory mantra, ‘it’s the deficit, stupid!’, all their targets on borrowing, debt and the budget deficit have been missed. Their neoliberal austerity agenda is failing, like elsewhere in Europe. Labour will also face the small problem of ruling without a comfortable majority – or, if the pundits and pollsters are to be believed, no majority. Labour’s first task will be to abandon the growth-choking austerity, as I have argued in my new book Back to the Future of Socialism, where I set out a coherent, evidence-based alternative, focusing initially on capital spending. But the key will be for incoming ministers to grip their briefs and departments in a way too many in government never do. When I was appointed a minister by Tony Blair in May 1997, nobody had really taught me how to be one. Although during the 1997 election campaign I had read Gerald Kaufman’s instructive if somewhat satirical book How to be a Minister, I relied upon my own experience, instincts and political values. Crucially important for an incoming minister is to have a plan; otherwise, the private office, diligent and supportive though I found all of mine in twelve years of government, quickly takes over and fills the diary, prompting busy hours of worthily processing papers and shuffling between meetings. Most important is to arrive on the first day with a sense of political priorities, even if the detail needs to be filled in. Otherwise even the most able ministers find themselves running to keep up, and sinking under piles of routine paperwork. Many in our ministerial cadre, particularly though not exclusively below cabinet level, seemed more captured by their departments than not. However, Charles Clarke was a notable exception. In 2000, when we were both ministers of state, he in the Home Office, me in the Foreign Office, we had a meeting to discuss getting retired police officers to help with the transition from military peacekeeping to local civilian security, especially in African conflict zones. My officials had been frustrated by lack of co-operation from their Home Office counterparts and recommended a ministerial meeting to resolve the impasse. Often on such occasions, a ministerial colleague would regurgitate their brief and the meeting would end, with officials happily going off to do what they love doing: reflect, write a fresh paper and prepare for another meeting. ‘Departmentalitis’ is rife within Whitehall, the Treasury by far the worst offender, so I was briefed up to persuade Charles of the merits of the proposal. He arrived, plonked his burly frame on my office sofa, eyed up the grand old colonial surroundings, and politely interrupted my opening remarks: “Peter, I have looked at this carefully – and I completely agree with you.” His officials looked more startled than mine. “Now shall we tell them all to work out the details as quickly as they can, and let’s discuss some politics?” As the room emptied, we reflected upon what proved to be a common perspective on the shortcomings and successes of the Blair government and how to make it better. How refreshing it was to deal with Charles. It is pointless being a minister unless you are prepared give political leadership. Although the legendary Yes Minister television series, where civil servants run rings around their hapless minister often comes uncomfortably close to the mark, my experience was rather different. Officials, I found, valued strong political leadership and direction – ministers who knew their own minds – provided they were willing to take advice. The best private secretaries ensured delivery of my ministerial decisions whilst keeping a wary eye for propriety and telling me things I might not want to hear. The best officials had a ‘can do’ rather than a ‘can’t do’ attitude and, if the civil service only adopted that motto as the norm it would be massively more efficient and immeasurably better at delivery. Maintaining a grip on the ministerial brief involved striking a balance between the routine and the significant. My years in government suggested several lessons. Around 80 per cent of the pile of papers and files in your in-tray or red box was straightforward and could in principle have been handled by the departmental machine. You needed to keep a weather eye on this bulk because it might contain elephant traps or plain mistakes. It might also contain what I called ‘piss-off’ messages to MPs, couched in turgid prose by drafting officials blissfully oblivious to their impact. You couldn’t simply sign off this material even if tired or late at night. However, for me, doing the job successfully meant focusing as clearly as possible on the 20 per cent where a difference really can be made. I also ‘did my red boxes overnight’, keeping on top of the workload, leaving more time to prioritise and focus on the politics. Are we in office but not in power? That age old question for Labour governments will be worth every one of Ed’s new Labour ministers asking themselves every day. Writing in today’s Times on Sunday Peter Hain tells why Labour’s fortunes in Wales couldn’t be more different from those in Scotland. Why where Special Branch watching me even when I was an MP? Following media revelations about old MI5 files held on Labour government ministers, the head of MI5, Sir Stephen Lander, came to see me at the Foreign Office in 2001 when I was Europe minister. Low key and courteous, he confirmed there had indeed been such an MI5 file on me and that I had been under regular surveillance. However, he was at pains to say, I had nothing to worry about because the file had long been “destroyed” when I had ceased “to be of interest”. Furthermore, he was anxious to impress, I had “never been regarded by the service as a communist agent”. He made no mention of what appears to have been an entirely separate tranche of files compiled by special branch on me and a group of similarly democratically elected, serving MPs. That special branch had a file on me dating back 40 years ago to Anti-Apartheid Movement and Anti-Nazi League activist days is hardly revelatory. That these files were still active for at least 10 years while I was an MP certainly is and raises fundamental questions about parliamentary sovereignty. The same is true of my Labour MP colleagues Jack Straw, Harriet Harman, Jeremy Corbyn, Diane Abbott, Ken Livingstone, Dennis Skinner and Joan Ruddock, as well as former colleagues Tony Benn and Bernie Grant – all of us named by Peter Francis, a former Special Demonstration Squad undercover police spy turned whistleblower. Formed in 1968, the SDS, an undercover unit within special branch, infiltrated “radical” political movements which it deemed a threat to the UK state. It is documented that Britain’s security services penetrated progressive campaigns, leftwing groups and trade unions during the 1960s-1980s when even noble fights against the evil of apartheid, protests against the Vietnam war, or strikes against worker exploitation, were seen through a cold war prism as “subversive”. Although activists like me vigorously opposed Stalinism, that didn’t stop us being lumped together with Moscow sympathisers, providing a spurious pretext to be targeted. But Peter Francis states that he inspected our files during the period from 1990 when he joined Special Branch to when he left the police in 2001 – exactly when we were all MPs. Jack Straw was a serving home secretary from 1997, and I was a foreign office minister from 1999, both of us ironically seeing MI5 or MI6 and GCHQ intelligence almost daily to carry out our duties. Because the principle of parliament’s sovereignty and independence from the state is vital to our democracy, having an active file on sitting MPs deriving from their radical activism decades before is a fundamental threat to our democracy – even more so if special branch considered our contemporary political views or activities as MPs merited such a file. Though on 6 March 2014, the home secretary, Theresa May, announced a public inquiry into the SDS’s operations, she has so far refused a request from me to include within its remit surveillance of the MPs identified by Peter Francis. This is intolerable. The inquiry is now being established and should investigate on what basis, and for what purported reasons, MPs were targeted by the SDS, who specifically was monitored, how that took place, what information was collected about them, with whom was this information shared and on what basis. The House of Commons also needs to know whether this monitoring affected our ability as MPs to speak confidentially with constituents, and what, if any, impact that had on our ability to represent them properly. Did this surveillance by the SDS cause any miscarriages of justice, for example, if a constituent confided in an MP regarding a complaint or claim they intended to pursue against the police or any other state body with which the SDS shared information. We know, for example, that the campaign to get justice for Stephen Lawrence, the black teenager murdered by racists, was infiltrated by the SDS and that the police blocked a proper prosecution. Did police infiltrators in the Lawrence campaign exploit private information shared by constituents or lawyers with any of us as MPs? Parliament should be told. At the very least, the home secretary should order the police to disclose all relevant information and, to each of the MPs affected, our complete individual Personal Registry Files. In September 2001 MI5 was forced to open many of its secret files for the first time after an independent tribunal accepted that a blanket ban on releasing information was unlawful under the Data Protection Act. It is one thing to have a file on an MP suspected of crime, child abuse or even cooperating with terrorism; quite another to maintain one deriving from radical political activism promoting values of social justice, human rights and equal opportunities shared by many British people from bishops to businessmen. This whole affair also raises a question as to whether the 1966 “Wilson doctrine” now needs expanding to cover surveillance as well as telephone tapping of MPs. That year, after a series of scandals over tapping MPs’ phones, prime minister Harold Wilson told parliament that MPs’ phones should not be tapped and that any change to that position would be a matter for the Commons. The Wilson doctrine has never been contradicted by any of his successors. Indeed, when I was a cabinet minister, Tony Blair reaffirmed it. The question raised by this evidence from Peter Francis is whether the police and the security services really have their eye on the ball. Their absolute priority should be to defeat serious crime and terrorist threats – and that may obviously involve going undercover in a manner that can be completely justified. When I was secretary of state for Northern Ireland, from 2005 to 2007, I was aware of such undercover operations and of the vital role they often played. But conflating serious crime with political dissent unpopular with the state at the time is different. It means travelling down a road that endangers the liberty of us all. Peter Hain featured on yesterday’s Sunday Supplement to discuss the growth of Islamic State with host Vaughan Roderick. Due to give a lecture at Swansea University later this week the veteran MP argued that growing sectarianism among Muslim communities within the Middle East could only be combated by the region’s political powers taking a leading role in fighting Islamic State.